Welcome to the HBC Blog. Scroll down to see what’s been happening at HBC over time. Posts are presented in reverse chronological order (most recent first). To view a post on its own, click on its title. To go back in time, click on Older posts at the bottom of the page. 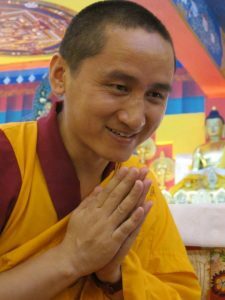 English-speaking Geshe Zopa studied at the Tibetan Monasteries of Kopan and Sera in Nepal and India respectively after being ordained at 12. 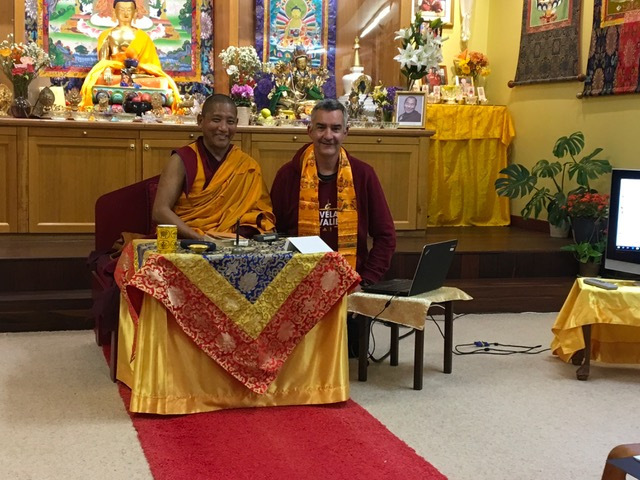 He is a visiting teacher at FPMT Buddhist Centres, understands the complexities of living in the West, and offers advice and teachings to help solve modern issues. He was recently awarded the World Peace Congress Prize in India. 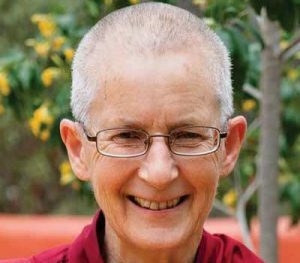 Geshe Zopa lived in Perth for a few years guiding the spiritual development of Phuntsok Rinpoche, a reincarnation of his teacher, a famed and accomplished meditator, Geshe Lama Konchog. The film “Unmistaken Child” documents his 5-year search for his teacher. Come and listen to an authentic and enthusiastic teacher in the tradition of His Holiness the Dalai Lama. The funds raised by this event will go towards the building of Machig Labdron, a new nunnery in Bendigo Victoria. Read more about this project here. Free street parking is available on weekends. 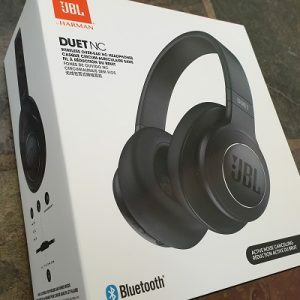 The event will also be used to draw the winner of a fundraiser raffle for a set of bluetooth noise-cancelling headphones. More details on the raffle. Click here for directions to the restaurant. The new nunnery outside Bendigo in Victoria is starting to move. Machig Labdron Nun’s Community will share a site with the Great Stupa for Universal Compassion, Thubten Shedrup Ling Monastery and Atisha Centre so will be part of a Buddhist oasis in Australia. It will provide nuns with a conducive environment to live in their vows and to dedicate their lives to the study of the dharma, practice and retreat. It provides a precious opportunity in today’s world of increasing self-obsession and distraction. 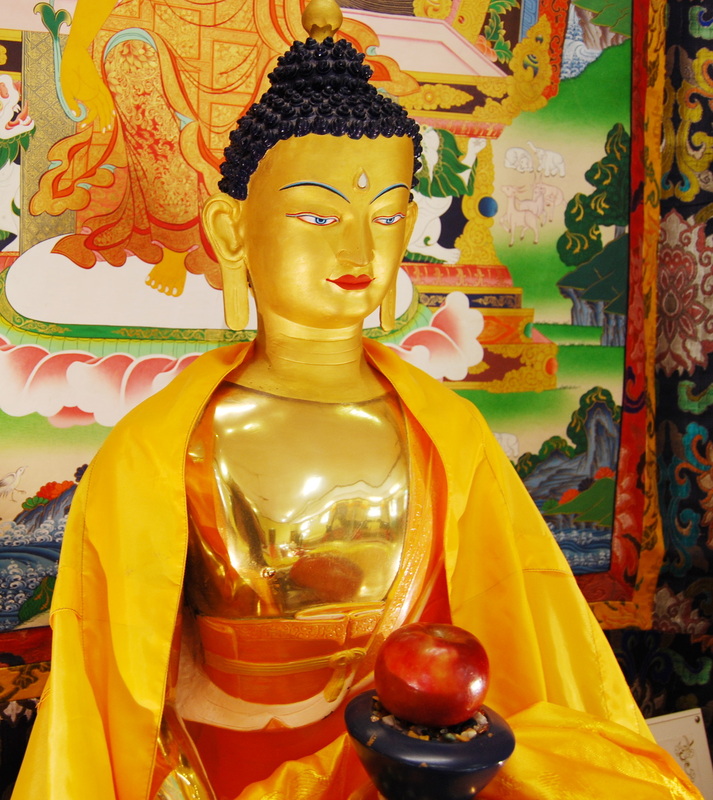 Buddhism exists more than 2,500 years after the Buddha passed away because of the education provided by monasteries and nunneries over the centuries. Similarly, these institutions are vital to preserving Buddhism in Australia. 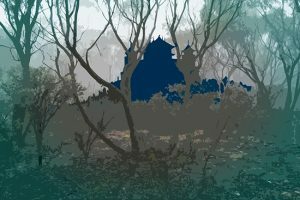 A site for the nunnery has been chosen on the 89-hectare (220-acre) site where the Buddhist projects are located about 15 minutes’ drive from Bendigo. It will be on a cleared area which will reduce the need to cut down trees or disturb native vegetation. The proposed nunnery will have accommodation for up to 16 nuns as well as a gompa and communal facilities. It will be a passive house design aiming for low energy consumption and high comfort. The site slopes to the north and the plan is to have a lower floor cut into the earth on three sides with a northerly aspect. A revised master plan for the whole site will be re-submitted to the Bendigo City Council to comply with new regulations, passed after the master plan was first submitted, for stricter fire safety ratings and greater preservation of indigenous vegetation. Once that has been approved detailed plans will be drawn up with a local sustainable architect. Project Manager, Ven Tenzin Tsapel, says the project has seed funding and as plans consolidate a detailed fund-raising campaign will be launched to inform interested parties and gain the support to complete the project. She said it was auspicious that Rinpoche made a generous donation and offered the nunnery the large White Tara statue offered to him during the Long Life Puja at the retreat in Bendigo in 2018. We invite you to attend her teachings and/or workshops between 25 January and 10 February 2019 and encourage you to book and pay online in advance so we can manage seating arrangements. 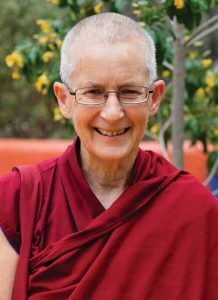 Venerable Thubten Dondrub is a much loved and former teacher at Hayagriva Buddhist Centre. Ordained as a monk in 1977, he has been teaching Buddhism around the world since the 1980s. He led the famous Kopan course 8 times. He has studied many of the great texts, taken numerous teachings from Buddhist masters and completed many retreats including a recent 17-month solitary retreat. 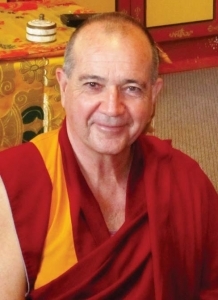 Venerable Dondrub understands modern Australia and puts Buddhist ideas into that context. We invite you to attend his teachings and/or workshops between 8 and 20 January 2019 and encourage you to book and pay online in advance so we can manage seating arrangements. Lama Tsong Khapa was a highly realised 14th century meditator, scholar, and saint who founded our Gelugpa school of Buddhism. His teachings are said to be particularly powerful for the people of today. Join us for the afternoon Guru Puja and extensive Light Offerings on Sun 2 Dec at 4pm in commemoration of this great practitioner. 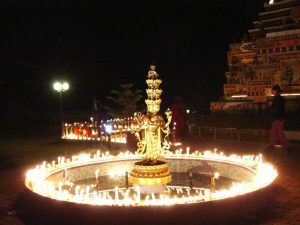 Lha Bab Düchen this year takes place on 31 October 2018. 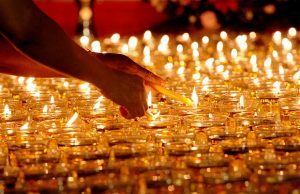 It marks the day when Shakyamuni Buddha descended from the Heaven of the Thirty-three after giving teachings to his mother who had been reborn there. On this auspicious day, all virtue created is multiplied 100 million times as stated in the Vinaya text “Treasure of Quotations and Logic“. Join us in celebrating this day with auspicious and merit making activities. As some of you already know I have made the decision to go back to France with my family. As I explained to a few people, what I will miss the most when leaving is my Australian dharma family that I met at the Hayagriva Buddhist centre. In the last four years, there were times when I felt homesick but the people at Hayagriva and the teachings from Geshela have always been of great support to myself and my family. As I explained to Geshela I haven’t yet the inner peace that will enable me to be happy anywhere I go but I’m working on it. Although I feel that my heart is in France, there will always be a part of me that remains at the Hayagriva Buddhist Centre. These life changing events, be they good or bad are always a great opportunity to put the dharma teachings into practice to advance on the path. 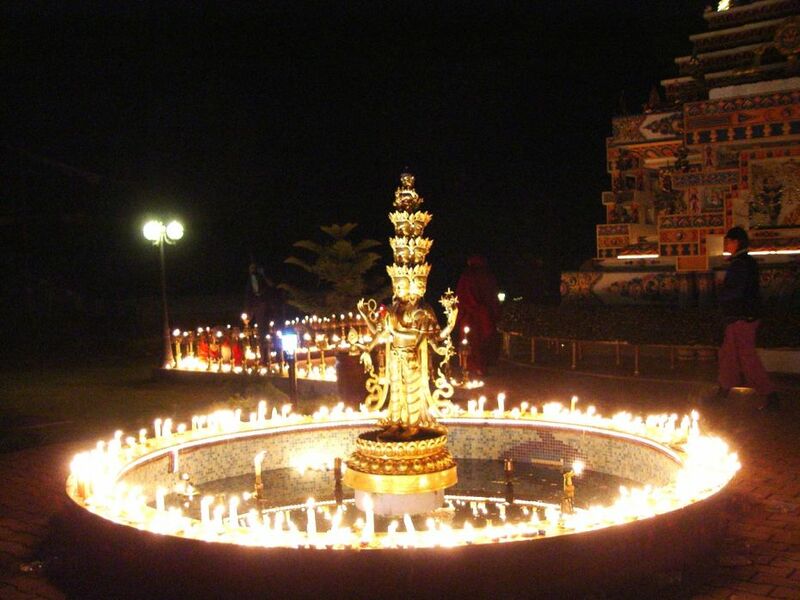 While living in France I will be near the Vajra Yogini FPMT centre and the Nalanda monastery in the south of France. As I meet new dharma friends and new teachers, I will try to carry on with the basic program at Hayagriva to maintain my connection with the centre and my teacher. I wish the Hayagriva centre and its students all the best for the years to come. I wish you all to create the merits to fulfil all your aspirations for the benefit of all sentient beings. I hope that we meet again in this life and if not, I’ll catch up with you on the path some other time. Last but not least by any means, a big thank you to our teacher Geshe Sonam for his teachings and his inspiring qualities. We are very fortunate to have such a highly knowledgeable teacher available to us in Perth. Geshela, may you be able to remain in Perth and continue to guide all sentient beings towards happiness. Bye for now dear friends and if you go to France come for a visit. With lots of love and warm hugs. May the glorious gurus’ lives be long and stable. May all beings equalling the extent of space have happiness. And may we be blessed to quickly attain Buddhahood.